With the 100th anniversary of the Triangle Shirtwaist Factory Fire coming up next Friday the Progressive Jewish Alliance has put together some materials that commemorate this tragic event and invites you to discover your own connection to a dark chapter in our country’s history. A very familiar Jewish perspective says “Those who do not remember history are bound to repeat it.” In light of the recent attempt to strip the American worker of the protections of Union membership, collective bargaining rights, etc., the timeline, history, poetry and writings of the survivors seem particularly timely. I would like to thank the 82.41% of registered voters of the great city of Los Angeles for having such trust and confidence in the 11.59% of us who voted in Tuesday’s election. Half of the City Council, half of the Los Angeles Unified School District Board of Education and half of the Los Angeles Community College District Board of Trustees were picked. Voters also weighed a bunch of ballot measures that will decide where some of our tax money will go. Yes, less than 12% of us decided how the city will be run for the next few years. It’s very simple. As long as we still have a democracy, get out and vote. It’s the way our voices are heard. A Chink in the Wall: Los Angeles Ballot Measure H Passes! In the face of the massive, ongoing power-grab by the right-wing conservatives in the service of their corporate masters there has been little to cheer about in recent months. Item by item we have seen our constitutional protections threatened, our rights degraded and our societal safeguards pulled out from under our feet. Underlying so much of these losses is the fact that our politicians are almost completely bought and paid for by corporations looking to curry favor from elected officials. And in the face of such large amounts of money, most politicians lose any shred of integrity they may have had and think only of how they will win re-election when their current term is up. By accepting large corporate campaign donations the elected official feels obligated to make political and legislative decisions that favor their corporate donors – usually at the expense of the middle class, the working poor, seniors, the mentally ill and other vulnerable groups, not to mention the environment. BUT! We finally have some good news as a result of the passage of Ballot Measure H which passed in yesterday’s Los Angeles election. Measure H is the first step in changing the way elections are held in the state of California. Establishing public funding for political campaigns is the only way we will ever get our democracy out of the clutches of big money and level the playing field so that qualified candidates can run for office without having to seek out or accept corporate or private donations. When elections are publicly funded the elected officials will not be beholden to any donor. They will be able to do the job they were elected to do without corporate influence and without spending – as they do now – almost 30% of their day fund-raising for their next election rather than doing the people’s business. Voters Resoundingly Say “YES” to Fair Elections in Los Angeles! Last night, Los Angeles residents sent a message to leaders across the state and across the country: It’s time to end corporate and big money special interest control of our political system. By an overwhelming 3-1 margin, 75% of Los Angeles residents voted “YES!” on Measure H, the Los Angeles Clean Money, Fair Elections measure. The immediate ramification of Measure H is that bidders on large city contracts will no longer be allowed to make campaign contributions to elected officials who decide who wins – some of the most potentially corruptive campaign contributions one could imagine. But the most important result of Measure H is lifting the maximum balance in the City’s public financing campaign trust fund. This will eventually allow L.A. to move to full, Clean Money, Fair Elections public funding of campaigns, so that candidates don’t take big money from any special interest donors and are accountable only to the voters. And believe us, when the time is right, we’ll be asking you all to help demand that it does! Although clearly labeled satire there were those who took the piece at face value and went to great lengths to argue with what they thought the article was saying. Others expended a lot of energy talking about the “privileges” of being a teacher (short hours, 3 months a year off, etc. ) and asserted that teachers need to step up and shoulder their fair share. Without re-hashing the conversation (you can read all the comments and my replies on my Newsvine page by using the link above) let me just say that, when read as intended, what is offered is a sarcastic title with a Stephen-Colbert-style text that actually DEFENDS teachers and shows what nonsense it is to think that teachers aren’t already shouldering more than their fair share for far less than they ought to be paid. Sarcasm: Stating exactly the opposite of what you mean. Satire: Using humor to show that a point of view or behavior is foolish. Just recently I’ve seen a number of examples of sarcasm and satire that got interpreted by the viewer as though they were serious statements and a truly surprising misperception of a song lyric that really threw me for a loop. The focus here is accepting that sometimes the world looks so completely different to the person standing next to you as to be unrecognizable. The song in question was written by my good friend, singer/songwriter John M. The title of the song is “My Mother In Me” and is, to most listeners, an ode to his mother listing the many ways John’s mother contributed to what is good and right in his life. And sometimes how to stand and fight. My momma didn’t raise no fool. It seems a great many people these days are looking at what they want to see rather than what is actually in front of them. Others project from within themselves something that isn’t there. Still others, I am told, have a physical brain configuration that makes them incapable of perceiving satire and sarcasm. “Teachers’ hefty salaries are driving up taxes, and they only work 9 or10 months a year! It’s time we put things in perspective and pay them for what they do – babysit! hour. That would be $8 X 6 1/2 hours X 30 children X 180 days = $280,800 per year. something wrong here! There sure is! students=$9.25/6.5 hours = $1.42 per hour per student–a very inexpensive baby-sitter and they even EDUCATE your kids!) WHAT A DEAL!!!! This is a reprint of an article from yesterday’s Salt Lake Tribune: I want to personally thank Tribune columnist Robert Kirby for a welcome reality check. In an era of absurd news items this is one of the more absurd of late. The State Bird of Utah is…. the California seagull(!?!) And now they want a state gun! “A bit of personal disclosure seems in order before I start. Rep. Carl Wimmer, R-Herriman, is a friend of mine. Carl and I live in the same neighborhood. I used to be his home teacher. His wife Sherry is a wonderful woman, who, like my wife, struggles daily with the misfortune of being married to a lunatic. That said, I do not share Carl’s uber-conservative politics. He knows I don’t vote for him. In fact, whenever I see Carl on TV, I want him to shut up. He won’t, though, but then neither will I.
Carl is currently sponsoring a resolution that would make the Browning model 1911 handgun Utah’s official handgun, a move I find completely ridiculous. First, because we need an Official State Firearm like we need a hole in our … um, never mind. We just don’t need one. But if we did, it shouldn’t be the model 1911, even though famed Utah gunsmith John Moses Browning invented it. I get that we have some official state symbols, including a few which actually make sense — the state animal is the Rocky Mountain elk, state fish the Bonneville cutthroat trout, and coal is the state rock. Then there are the head scratchers, such as the state cooking pot, fossil, tartan, vegetable, HISTORIC vegetable, star, anti-depressant, grass, dance, colonoscopy, hymn, etc. Note: I made up a few of those. I’ll let you figure out which ones. I’m against the proposed Utah state gun for the same reason I’m against the California gull as the Utah state bird — it’s a poor fit and representative of Utah only by the thinnest of margins. The seagull (flybyus excretus) became the Utah state bird not because it’s indigenous to Utah or, frankly, even motivational. It’s because of religion. Seagulls reportedly once ate all the crickets threatening Mormon pioneer crops. Religion is also behind the official state emblem (beehive), state bug (honeybee), state flower (sego lily), and state vehicle (minivan). None of these are particularly inspirational or even solely specific to Utah. With all disrespect, no, it’s not. If you want a gun that is Utah, it should be the Hot Glue Gun. After all, more Utahns own one of those than a .45-caliber automatic. Scrapbooking, church crafts, weird hobbies and jury-rigged fixes, the hot glue gun has contributed far more to making Utah what it is today than the Model 1911. Like an actual firearm, a glue gun can be used inappropriately by fools and criminals. I’m both. Following a hiking accident last year, I tried fixing a split toenail with a hot glue gun. I immediately wished for a Utah state burn ointment. On the bright side, perhaps there’s a loophole in Carl’s Utah state firearm resolution. 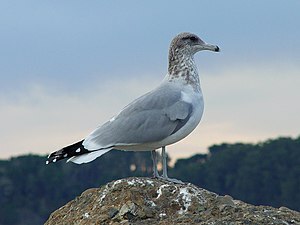 If it is adopted, maybe then, like the California seagull, it will be against the law to shoot them.